Jaundice in a common issue for babies—and a new treatment may allow babies to get well while still snuggling up with Mom. While most cases of jaundice will clear up on their own after two weeks, sometimes babies need a little help if the bilirubin levels creep up too high. As the American Academy of Pediatrics explains, too-high levels of bilirubin can put your baby at risk for serious complications like hearing loss and brain damage. 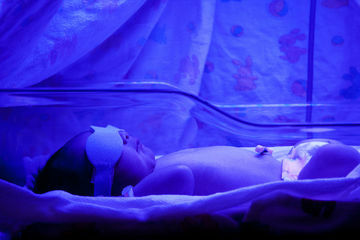 Treatment for jaundice is often done through phototherapy: Your baby is placed under special lights that kind of look like a tanning bed, which help breakdown the excess red blood cell byproduct. It's totally non-invasive, but while your baby is receiving treatment with the bililights—which can be as long as two days or more—your ability to cuddle and hold your baby is limited, since they need to be under the lights as long as possible. As a new mom, being unable to pick up and hold your baby is hard. It makes bonding more challenging, limits the skin-to-skin contact that often helps calm newborn babies and can hinder the start of breastfeeding. Not to mention that while it's not an invasive or painful treatment for your newborn, it's hard to see your brand new little one in an isolette wearing protective glasses. But, there's a new product that could potentially make treatment a whole lot easier—a SnugLit. It's a new swaddle blanket that incorporates the phototherapy needed to treat jaundice, and allows the treatment to take place right in their parents' arms. "The unique SnugLit swaddle design promotes parent-infant bonding while decreasing the stress to mother and baby, and allows for easier breastfeeding," said Ryan Jankovic, CEO of TheraB, the company that developed SnugLit. The product, which is still being developed and awaiting approval from the Food and Drug Administration, has plenty of benefits—it's battery-operated and portable, easy for parents to use, and it provides more coverage of the lights to the skin, ensuring treatment is being given effectively. A great way to avoid missing out on that precious newborn cuddle time? We're totally on board.